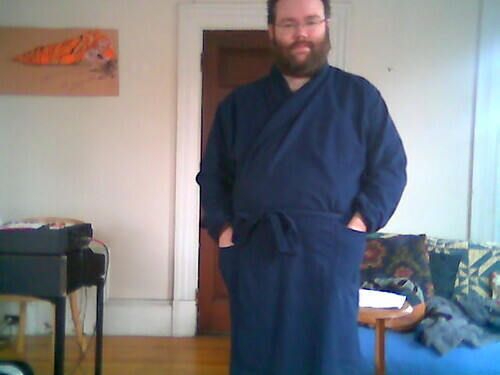 This morning, I decided to follow up on my earlier post and take a picture of myself in my bathrobe. 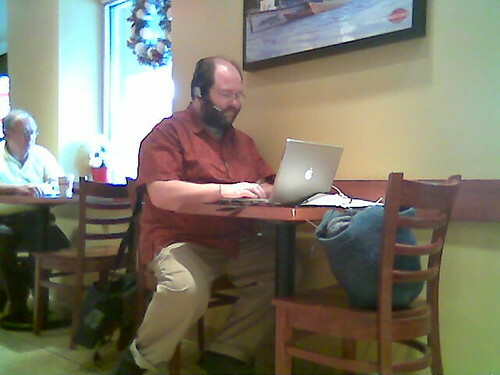 I was working from home, fancy-free, not wearing any pants ... here I am. See how content I was? Of course, immediately after that my Internet connection started to go all wonky. At first I was getting 70% packet loss, and then, after restarting my router, I couldn't connect at all. I called Cox customer support, did various troubleshooting stuff, and ultimately made an appointment for them to come out and check things out tomorrow between 3-5 pm. I'm looking noticeably less content (or smug for that matter), aren't I?